April 17, 2012, 10:30 a.m.
Around one-third of Politico’s newsroom is dedicated to Pro, its $3,295-a-year premium product for Hill staffers, lobbyists, and others who need policy news on their BlackBerry — now. By Adrienne LaFrance @adriennelaf April 17, 2012, 10:30 a.m. Most nights on Capitol Hill, the Senate and House press galleries begin to thin out around dinner time. The deadline rush subsides, and all but a scatter of reporters remain. 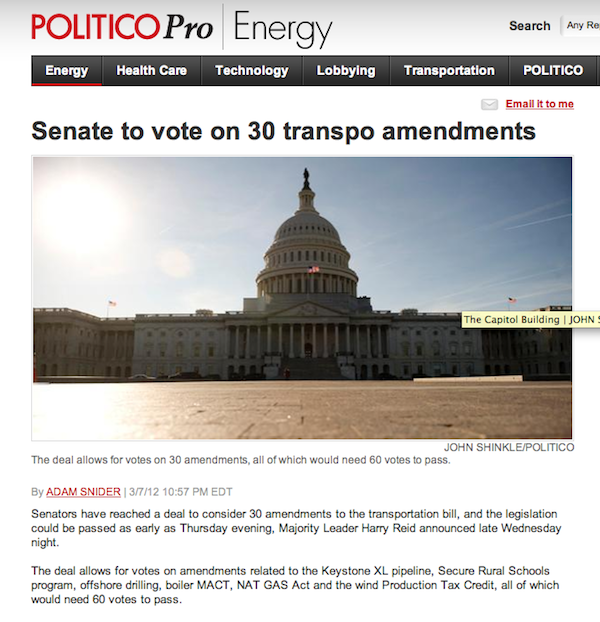 It was approaching 11 p.m. on March 7 when Senate Majority Leader Harry Reid announced a deal that cleared the way for voting to begin the next day on 30 amendments tied to a $109 billion transportation bill. Inside baseball, sure, but it’s news that matters inside the Beltway, and matters to a lot of people. It’s the kind of deal you might want to know about right away if you were a member of Congress or a lobbyist or someone else who has to keep track of policy for a living. But it’s unlikely you would have found out about the deal on TV, or on Twitter or via any major newspaper’s website that night. Even traditional policy publications didn’t have it. Enter Politico Pro, the pricey premium news service, launched last year with the goal of doing for policy coverage what Politico set out to do for political coverage five years ago. Less than an hour after that, a reporter for Politico’s core site broke the news that President Barack Obama had been personally lobbying Democrats in the Senate, urging them to reject one of the amendments that turned out to be on the list. In the span of an hour, Politico and Politico Pro — we’ll get to the distinction later — had significantly advanced a major story in a way that would inform the next day’s business on Capitol Hill. For people involved in that business, knowing about these developments before getting to work the next morning would have been key. “Now” is increasingly the answer among smartphone toting news consumers. But like many premium niche news services, the nowness that Pro delivers comes with a steep price tag. A year into its life — and as more publishers consider whether a premium-content strategy might make sense for them — Politico Pro’s success is a model worth watching. 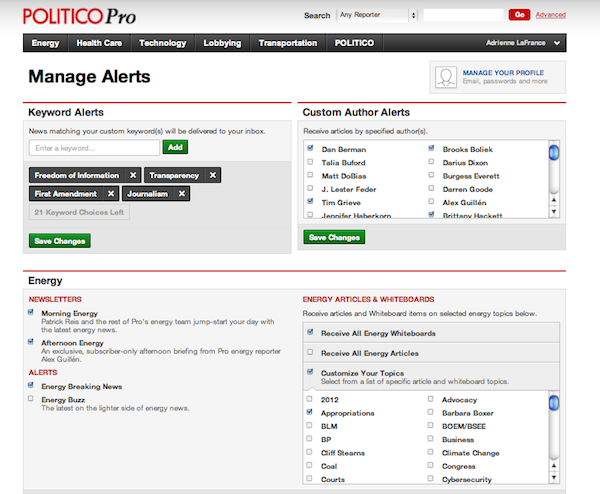 Politico Pro covers four major policy areas: technology, energy, health care, and transportation. Newest in the mix is the transportation section, which launched on Tuesday. The site plans to add at least one more vertical before the end of 2012. Of Politico’s 217 total employees, more than 150 are on the editorial side, with 45 of them dedicated to Pro. The rest work in sales, technology, and events. For an individual subscribing to one of Pro’s verticals, pricing starts at $3,295 per year. But most Pro subscribers are part of a group membership, and those start at around $8,000 per year for licensing content from a single vertical to five people. Pro bans subscribers from sharing or forwarding content. Add more employees to an organizational membership and the “price becomes more fluid,” says Miki King, Pro’s executive director of business development. So it’s not surprising that about one-third of Pro subscribers are government workers. The other third is “everybody else,” King says. We set high editorial standards, and we achieved them. We set big goals for Pro’s first-year sales, and we beat them. We set big goals for Pro’s first-year renewal numbers, and we’re beating those, too. Readers want the kind of journalism Pro produces — fast-moving, decisive POLITICO-style journalism applied to the specific policy areas that interest them most. Because of this success, POLITICO has the most reporters working the most important policy areas in Washington — and all our readers benefit from this when we turn to the PRO team to write for our broader audience on energy, health care and technology matters. That also means changing the way Pro’s stories are constructed. For Politico Pro, grabbing readers by the lapels means getting into their inboxes. Because the overwhelming majority of Pro subscribers are in Washington, that means catering to their reliance on BlackBerrys, which are — believe it or not — still ubiquitous on the Hill. Pro’s phone-centric approach means that its subscribers spend “very little time” on the site itself, Grieve says. There’s also no plan to move into text-messaging territory. Instead, subscribers get Pro updates on their BlackBerrys while rushing between hearings, while they’re waiting for a meeting with a Senator, or while they’re otherwise on the go. “Any time that we write about your member of Congress, your agency, your company, your client, that’s instantly sent in full email text to your BlackBerry,” VandeHei said. It may sound simple, but VandeHei calls what Politico Pro is doing “arguably the most important business innovation and arguably journalistic innovation” since Politico’s core site launched five years ago. Pro’s top editor Grieve also says that he’s hoping to foster more cross-pollination among reporters going forward. Already, there’s overlap. Pro reporters’ bylines are often on the core Politico site, and one Pro reporter recently hit the campaign trail with Mitt Romney when the core Politico team needed a break, Grieve says. “As we grow Pro, I think you’re going to see much more of that — much more crossing over and blending and people moving around the newsroom in creative and maybe surprising ways,” Grieve says. The other surprise will be what verticals Pro rolls out next. Executives won’t say which areas they’re exploring, but King says there are clues on the core site. The good news for those who can’t afford the pricey premium service — and for those who care about quality journalism in general — is that Pro’s growth directly affects what the core Politico team is able to cover. 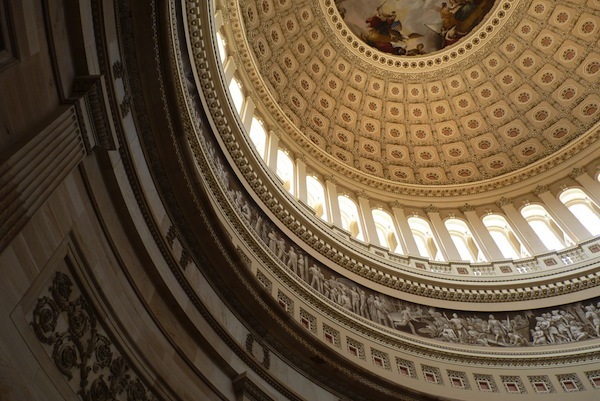 Photo of the U.S. Capitol Rotunda by ctj71081 used under a Creative Commons license. POSTED April 17, 2012, 10:30 a.m.
LaFrance, Adrienne. "Politico Pro, one year in: A premium pricetag, a tight focus, and a business success." Nieman Journalism Lab. Nieman Foundation for Journalism at Harvard, 17 Apr. 2012. Web. 18 Apr. 2019. LaFrance, Adrienne. "Politico Pro, one year in: A premium pricetag, a tight focus, and a business success." Nieman Journalism Lab. Last modified April 17, 2012. Accessed April 18, 2019. https://www.niemanlab.org/2012/04/politico-pro-one-year-in-a-premium-pricetag-a-tight-focus-and-a-business-success/.